Vodafone: Well, a little off the base, make it a bit curvier... perfect! 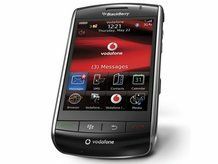 RIM's CEO Mike Lazaridis has said the first idea for the BlackBerry Storm, RIM's first touchscreen handset, was rejected by Vodafone for being too basic. Speaking to pocket-lint, he said: "I thought that when we put Quadband EDGE and GPS and a powerful CPU and high-performance graphics cards on one tiny board – I figured that that was enough of a breakthrough and Vodafone sent me packing!" It's been widely reported the concept for the Storm was driven in part by Vodafone and Verizon, the main carriers for the device around the world. But it's made the journey from a concept RIM had lying around to fully functioning device in just over a year, ready to compete with the other bevy of touchscreen handsets on the market. And given the comments of Jens Schulte-Bockum from Vodafone, which state he believes "will capture imaginations", it seems the new version might have met with approval. The innovative new touchscreen technology, which ditches buzzing signals in favour of a proper 'click' has been heralded by Lazaridis as the way forward after he believes haptics have failed thus far. "Touchscreens before have confused the act of navigating with the act of confirmation, or selecting. What we did is we is combined a state of the art multi-touch capacitive touchscreen and put in a sub-system underneath that allowed us to add the dimension of pressure. "It's far better than haptics. Haptics didn't work", he added.